MOLLUSCA : PTERIOIDA : Pinnidae SNAILS, SLUGS, ETC. 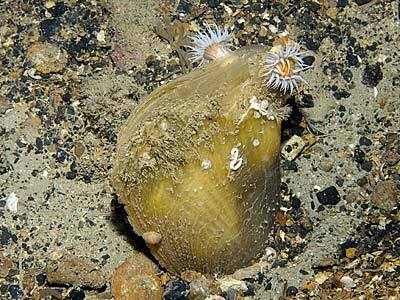 Description: The fan mussel is considered to be one of the most endangered molluscs in UK waters. It is a triangular shell which is thin and easily broken. It lives with the pointed end embedded in the seabed, attached by extensive byssus threads. Size, to 20cm tall. Picton, B.E. & Morrow, C.C. (2016). Atrina fragilis (Pennant, 1777). [In] Encyclopedia of Marine Life of Britain and Ireland.